The Quick Profits Guide To Co-Registration Leads MRR! "You are about to discover how to easily generate insane amounts of money with e-mail marketing! Open Up Your Own Pipeline To Profits & Generate All The Leads, Traffic & Coveted High Converting Customers Your Website Can Possibly Handle!" 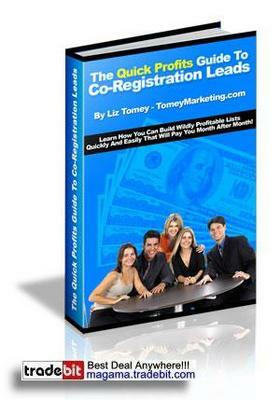 "The Quick Profits Guide To Co-Registration Leads" Is The Defacto Hands-On Guide For Using Co-Reg Leads & Email Marketing Tactics To Make A Ton Of Money With Online Marketing. Have you ever considered using e-mail marketing to generate maximum sales from your online business? But... do you also share the very common belief with thousands of others, that e-mail marketing is too difficult, too risky, and too expensive? Or worse yet, have you already tried e-mail marketing and it turned out to be nothing but a huge, very costly failure? Even if your answer was yes to all three questions, things can change for the better, and they're about to - so stay with me! We ALL share the same goal of wanting to make more money with our online businesses, but all too often we all seem to run into brick walls before we actually reach the incredible financial success we all deserve & desire. What if I told you that e-mail marketing truly does hold the key to generating huge profits? Right about now you may be thinking, "Oh SURE, that's what everyone says but you really believe that e-mail marketing is just a fancy way to describe SPAM". ...That Nothing Could Be Further From The Truth! Legitimate, professional e-mail marketing is the best way to attract new visitors to your web site and keep them coming back to buy your products or services over and over again. You CAN MAKE HUGE PROFITS by using e-mail marketing and I can teach you exactly how to do it. "The Quick Profits Guide To Co-Registration Leads" is an in-depth course that reveals the secrets to getting your hands on large numbers of e-mail addresses for people WHO REALLY WANT TO HEAR FROM YOU! These kinds of leads allow you to make the most of your time and effort by communicating only with people who have already indicated that they are interested in your business. Wait a minute, you say... I already have a system in place that allows customers and web site visitors to sign up for e-mail information and special discounts. That's great, and exactly what you should be doing -- but it's only the first step to making money through e-mail marketing! The truth is that you CANNOT build a big enough list and CANNOT execute logical, organized e-mail marketing campaigns by solely relying on a sign-up process on your website. The BEST way to generate large amounts of money is to continuously add to and communicate with your e-mail list in the easiest and most profitable manner. And the BEST way to get that continuous input to your list is to use co-registration leads. Co-registration leads are your ticket to cold, hard cash in your pocket! Everything You Need To Know About Using Co-Registration Leads To Make More Money Is Contained Inside This Outstanding Course! What exactly are co-registration leads? They are e-mail addresses of people who have signed up to get more information about your products or services as part of the sign up or purchase process at another web site or through another company. These are the most valuable leads you can ever get your hands on! This step-by-step course shows you exactly how to find these incredibly valuable leads and how to make the best use of them with logical, effective e-mail communications. Are you ready to learn precisely how truly easy it can be to make huge amounts of money? Then you're ready for "The Quick Profits Guide To Co-Registration Leads" course! You may have never heard of co-registration leads before, but I promise that by the time you finish this course you will be an expert at finding them, using them, and depositing the huge profits they generate into your bank account. Before this course came along, people just like you were using these techniques to get rich but they had to learn those techniques through trial and error - a very risky and difficult way to achieve success. You don't have to follow that same difficult road; why would you want to when this simple course is so easy to understand and use? "The Quick Profits Guide To Co-Registration Leads" Contains The Step By Step Guidance That Will Change Your Life! This is just a sampling of the critical information NOBODY ELSE CAN PROVIDE! Only "The Quick Profits Guide To Co-Registration Leads" contains EVERYTHING you need to get started, keep going, and make huge profits! Other guides might promise to teach you about using co-registration leads, but they simply cannot deliver on that promise in the same way that "The Quick Profits Guide To Co-Registration Leads" has been tested and proven to deliver. In other words, their promises are very often misleading and empty.